Obesity rates in the US have surged over the last year, a report shows. The Trust for America's Health (TFAH) and the Robert Wood Johnson Foundation found adult obesity rates rose in 23 of the 50 states, but fell in none. In addition, the percentage of obese and overweight children is at or above 30% in 30 states. The report warns widespread obesity is fuelling rates of chronic disease, and is responsible for a large, and growing chunk of domestic healthcare costs. 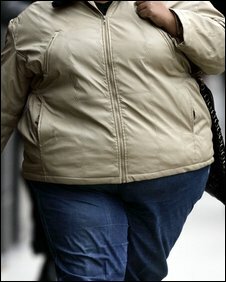 Obesity is linked to a range of health problems, including heart disease, stroke and type 2 diabetes. Dr Jeff Levi, TFAH executive director, said: "Our health care costs have grown along with our waist lines. "The obesity epidemic is a big contributor to the skyrocketing health care costs in the US. "How are we going to compete with the rest of the world if our economy and workforce are weighed down by bad health?" The US government has set a target of cutting obesity rates in all 50 states to 15% by next year. However, the report said this target was certain to be missed. For the fifth year in a row, Mississippi had the highest rate of adult obesity at 32.5%. Three other states - West Virginia, Alabama and Tennessee - also had adult obesity rates in excess of 30%. In just one state - Colorado - was the adult obesity rate below 20%. In 1991, no state had an adult obesity rate above 20%, and in 1980 the national average for adult obesity was 15%. Mississippi also had the highest rate of obese and overweight children (ages 10 to 17) at 44.4%. Minnesota and Utah had the lowest rate at 23.1%. Childhood obesity rates in the US have more than tripled since 1980. The report warns that the current economic crisis could exacerbate the obesity epidemic by driving up food prices, particularly for nutritious foods. In addition, it blames increased rates of depression, anxiety and stress for fuelling unhealthy living. A recent analysis commissioned by TFAH found that the Baby Boomer generation has a higher rate of obesity compared with previous generations. This suggests that the percentage of obese adults aged 65 and older could soon increase significantly.